This Live Blog session closed at 14:54 on 4 Aug 2016. The Bank of England has cut interest rates for the first time since 2009, as it calibrates its response to the Brexit vote. 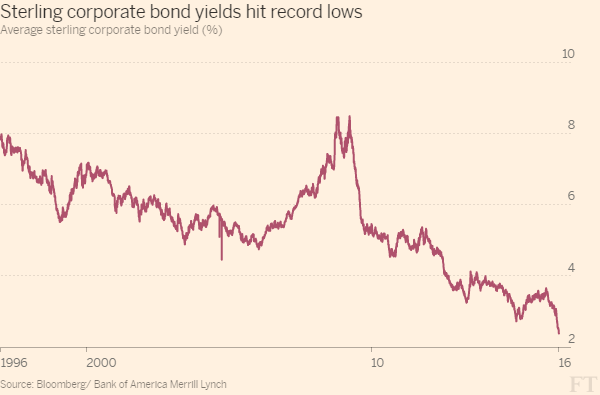 The BoE also boosted its quantitative easing programme, expanding its bond buying to the corporate debt market. Welcome to our live coverage of today’s Bank of England rate decision, which most economists expect will yield a 25 bps cut. Here’s where the BoE rate has stood since the turn of the century. 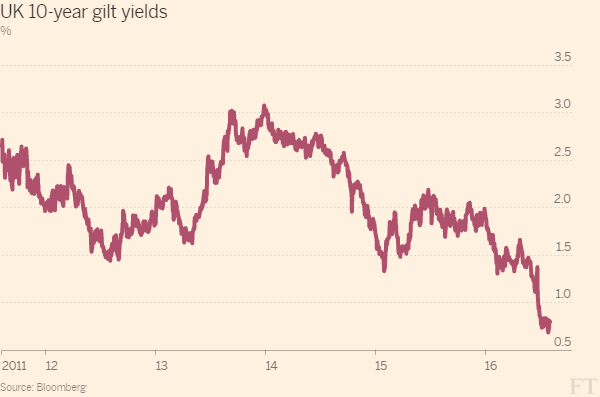 If you’re in the mood for charts, here’s what has happened to yields on 10-year gilts over the past five years. We have plenty of great stuff online already for you to read while you wait for the Bank of England decision. 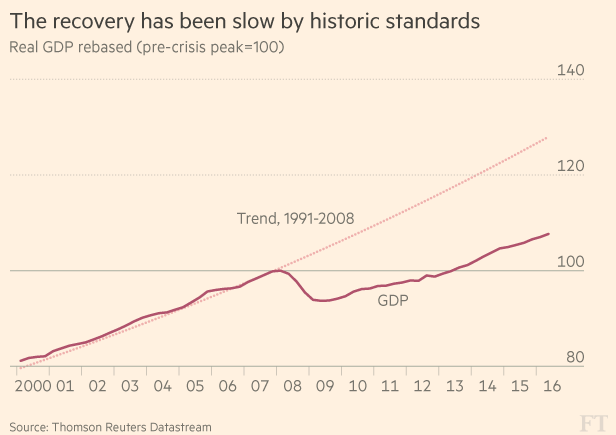 You can start here: Eight charts showing state of UK economy. The pound is down 0.3 per cent at $1.3293. In the immediate aftermath of the Brexit vote, sterling fell as low as $1.2798 but has mostly traded between $1.31 and $1.33 since. 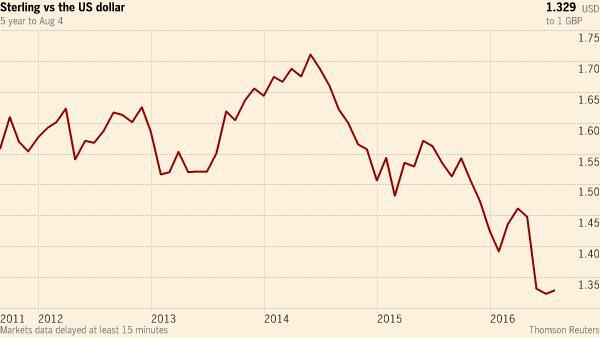 Sterling is down 9.1 per cent in 2016, making it the worst performer among major global currencies. The euro is down 0.2 per cent at $1.1128, while the dollar index is up 0.2 per cent at 95.71. The FTSE 100 is down 0.2 per cent in an unsettled morning. It has spent time either side of the flatline, although financial stocks have kept a place at the top of the market. 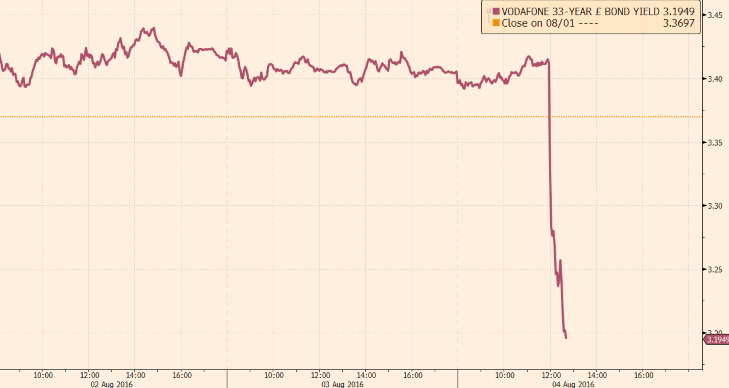 The more UK-centric mid-cap FTSE 250 has followed a similar pattern and is now down 0.1 per cent. Many investors had expected us to reach this point a month ago. But in last month’s decision the MPC surprised everyone by voting 8 to 1 to sit on their hands while they waited for more information. Still, they dropped a very heavy hint in the minutes of that meeting that they would be ready to act by August. In the absence of a further worsening in the trade-off between supporting growth and returning inflation to target on a sustainable basis, most members of the Committee expect monetary policy to be loosened in August. The precise size and nature of any stimulatory measures will be determined during the August forecast and Inflation Report round. The risk today is that markets are anticipating too much in the way of immediate easing when the MPC may wish to keep some powder dry to act in the future – should circumstances demand they do so. The reaction today could well be to see sterling strengthen, as there remain a bias of short sterling positions, and gilts weaken as they have performed better than other global bonds in anticipation of a range of easing measures. 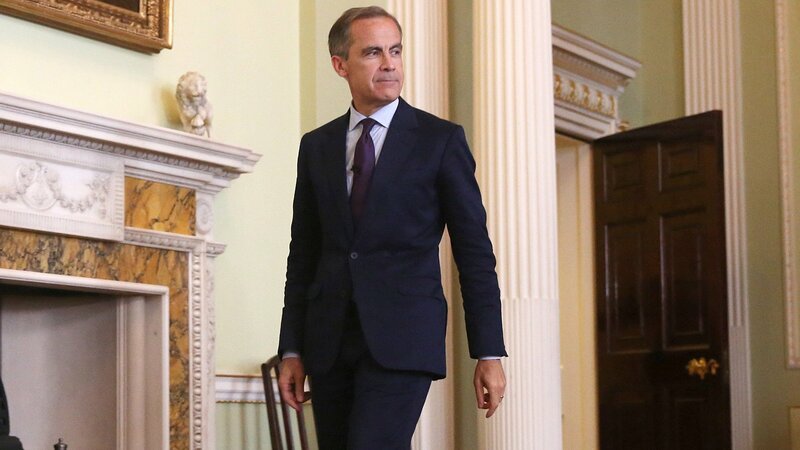 Should Mr Carney decide that the one path to ensuring the UK economy has a safety valve to support growth is a much weaker currency, expect the bazooka to be fully loaded and firing rate cuts, QE and more help to borrow cheaply. That is not our expectation, however. The BoE still doesn’t have any hard official data by which to judge the damage the Brexit vote has done to the economy. But the PMI survey – an unofficial but closely watched gauge of the economy’s momentum – has dropped like a stone. It’s now at levels consistent with a 0.4% quarterly contraction. The PMI has hardly been a perfect predictor of recession in the past, but it’s the best evidence we have so far. The FT splashed on the PMI this morning – you can read it here. The most wide-ranging survey of British business activity since the vote to leave the EU showed its sharpest drop in at least 20 years, intensifying pressure on the Bank of England to take stronger action on Thursday to prevent a recession. The survey of purchasing managers, which measures output in the manufacturing, construction and services sectors, fell to its lowest levels since the financial crisis because of what one former BoE rate-setter called “an unparalleled uncertainty shock”. There is an “evens” chance of Britain falling into recession by the end of next year, according to a leading economic think-tank, which called on the Bank of England to wield a “sledgehammer” against the expected downturn. The Bank of England will this week downgrade its growth forecasts following the vote to leave the EU and explain what action it will take in response. 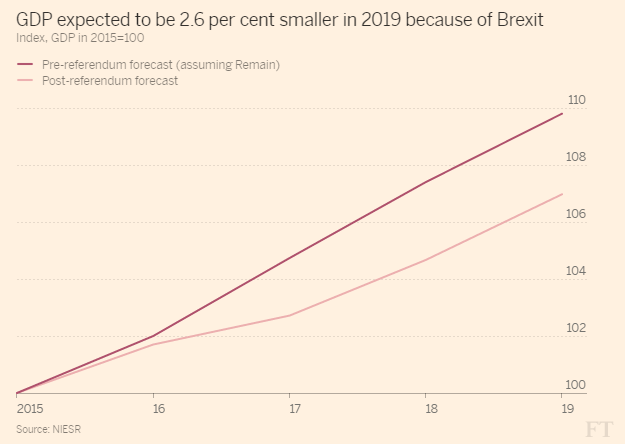 Governor Mark Carney said before the referendum that a Leave vote could result in a “technical recession” — two quarters in a row of the economy shrinking — and Thursday’s announcements will reveal whether or not policymakers think this is the most likely outcome. Growth forecasts are expected to be cut close to, and perhaps below, zero. 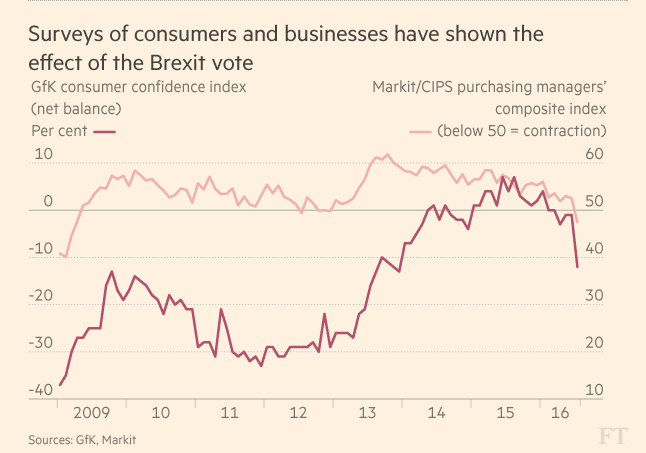 Here’s a chart showing the post-Brexit slump in business activity and consumer confidence. - How bad is the economic outlook? - What is the BoE assuming about government policy? - What does the BoE think a rate cut would do? - How much inflation is the central bank prepared to tolerate? - Will there be more asset purchases? - What about other measures? - What is the new overall direction of monetary policy? Click here if you want the answers. Here’s a lovely chart from the Resolution Foundation showing how much each forecaster has cut its predictions for GDP growth next year. Nomura is the most worried; Liverpool Macro Research the most sanguine. We’ll see the BoE’s forecasts at midday – which end of the spectrum will they be on? The Resolution Foundation points out that expectations for employment and wages have also been cut by (almost) everyone. Still, there’s a big range, highlighting how much uncertainty remains. So what are markets expecting at midday? Quite a lot, say analysts at RBC…in fact, possibly too much. 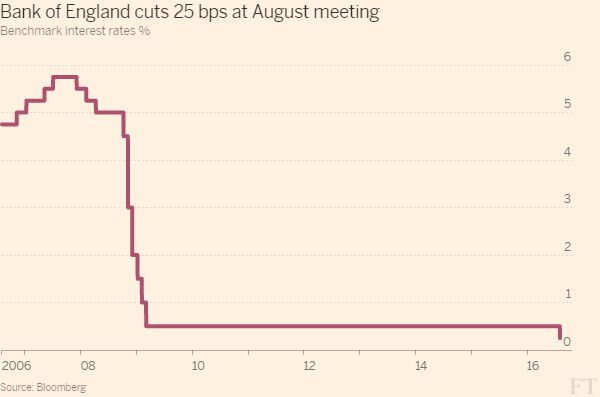 For today, a full 25bp rate cut has already been priced. More than that, however, the subsequent meetings also imply some further rate reduction with the trough in the SONIA forwards being around November at approx. 12bp which equates into an expected new Bank Rate low of 15bp. As said above, we do look for a 25bp rate cut as implied and also think there is a possibility for further rate reductions ‘towards zero’. Yet, there is certainly a distinct chance that the 25bp handle will be the new lower bound. Even if that is not the case, we struggle to see where further impetus for short term market valuations ought to come from. Unless the BoE cuts deeper than 25bp straight away or signals very clearly that a (much) lower level will serve as the lower bound (which we think is unlikely) and/or more rate hike will be coming the current pricing at the front end of the curve seems appropriate or even ambitious to us. What about more QE? It’s much harder to assess the extent to which investors are pricing in QE, but RBC says that newer bonds (where BoE purchases would probably be concentrated) are more sought after. Pension funds in the UK have urged the Bank of England to think carefully about the detrimental effect a fresh round of quantitative easing would have for savers before officials meet on Thursday. Banks are also likely to suffer, as they see a further erosion of their net interest margin. Analysts at RBC reckon that RBS and CYBG (Clydesdale Bank and Yorkshire Bank) would be the worst hit. Credit card providers are offering their longest interest-free balance transfer deals in at least four years despite efforts by the financial regulator to crack down on the industry for doing little to encourage people to repay their debts. Thanks to a fierce battle among banks for credit card customers, the average interest-free balance transfer period is 18 months, with six providers offering deals of 40 months or more. What will he do in this, his final meeting? Last week he gave an interview to the FT’s Chris Giles where he seemed to suggest he would vote for more stimulus. The clinching piece of evidence, he said, was the purchasing managers’ indices on Friday, which showed business activity dropping to its lowest level since spring 2009. “They are the best short-term indicator we have at the moment. I certainly feel they are very material for the decision we’ll be taking next week,” he told the FT, adding that they were “a lot worse than I had thought” and showed “expectations have worsened sharply”. “I see things rather differently from what I would have done had we not had those numbers and the material point is that they were collected after July 12, so after the initial shock of the referendum,” Mr Weale said. How loose is the UK’s monetary policy stance already, counting both QE and the base rate together? Peter Spence, formerly of the Telegraph, has this chart of the so-called “shadow rate”. With just 5 minutes to go until decision time, the FTSE 100 is flat as a pancake (down just 4 points), the FTSE 250 is up 0.3 per cent, while the pound has reversed its earlier losses against the dollar to reach $1.3330 against the dollar. Bank of England cuts 25 bps. QE expanded. Here’s the top of the story just filed by Emily Cadman and Gemma Tetlow, who’ve been in the BoE’s lock-in. The Bank of England has slashed its growth forecasts and launched a huge new stimulus package as it attempts to mitigate the damage it judges the Brexit vote has inflicted on the UK economy. Interest rates have been cut immediately to a new record low of 0.25 per cent, with the rate setting committee signalling there are more cuts in the pipeline. To offset the hit to banks’ margins from the cut, the BoE has established a new Term Funding Scheme for banks that would provide up to £100bn from central reserves. Lent at close to base rate – providing certain lending requirements are met – the scheme is an attempt to ensure the interest rate cut is fully passed on to both households and businesses. The central bank also launched a new £70bn bond buying programme, which will incorporate both government and corporate bonds. Over the next six months it will buy £60bn of government bonds, financed by the central bank’s reserves, taking the total stock of assets to £435bn. It will also purchase £10bn of sterling denominated investment-grade corporate bonds, but only from firms that make a “material contribution” to the UK economy. Unveiling the biggest downgrade to growth for over 20 years, the BoE said the outlook had “weakened markedly”. “I welcome the decision of the Monetary Policy Committee. The vote to leave the EU has created a period of uncertainty, which will be followed by a period of adjustment as the shape of our new relationship with the EU becomes clear and the economy responds to that. “It’s right that monetary policy is used to support the economy through this period of adjustment. That’s why I have authorised the Governor’s request for an increase in asset purchases and a new lending scheme to support the economy, helping ensure that the benefit of low interest rates is passed on by the banks to households and businesses. 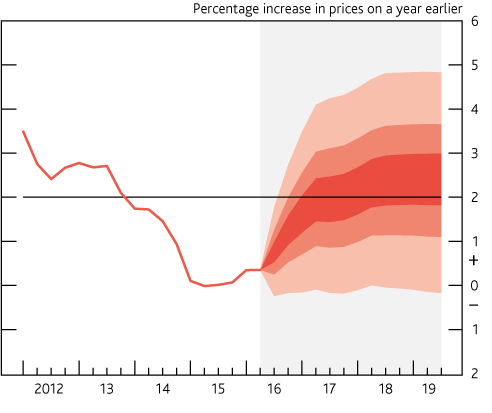 It’s clear that the Bank of England is once again following the financial crisis template: making liquidity readily available, easing monetary policy and looking through the risk of exchange-rate-fuelled inflation. But it is also becoming clear that the Bank cannot act alone. 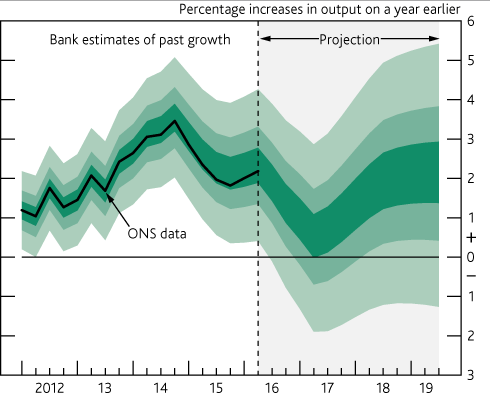 A combined Bank of England and Government programme of monetary and fiscal stimulus will be required if Britain is to avoid recession. Members of the committee voted unanimously for the immediate rate cut and the bank funding scheme. But the committee was more divided on the rest of the package. Kristin Forbes was the sole voice voting against the expansion of asset purchases to corporate bonds, due to worries that the stimulus was excessive considering the lack of hard data so far. She was joined in voting against the expansion of the government bond buying process by Martin Weale and Ian McCafferty. UK gilt yields just touched a new record low, the pound is extending its fall and UK equities indices and bond prices are rising after the Bank of England loosened monetary policy. The pound is down 0.6 per cent at $1.32141. The yield on benchmark UK 10-year gilts fell 12 basis points to anew record low of 0.67 per cent as investors bought the debt. 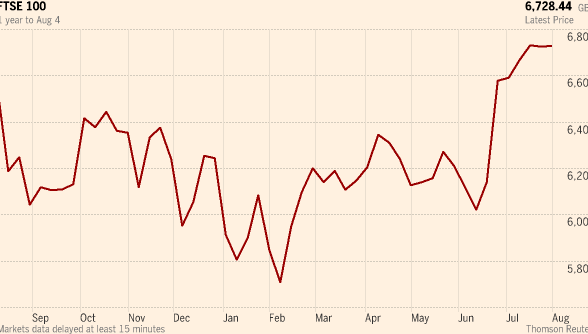 There’s been a nice little bounce on the FTSE100, with the index now up 1 per cent. The FTSE 250 is up 0.8 per cent. Before the announcement, the FTSE 100 was underperforming its continental neighbours in uncertain trade. After the BoE’s announcement, it overtook them to post the highest gain of the day in the region. The BoE has been reluctant in the past to cut rates below 0.5% because of fears it would damage banks’ profitability. Its solution to that is the Term Funding Scheme. 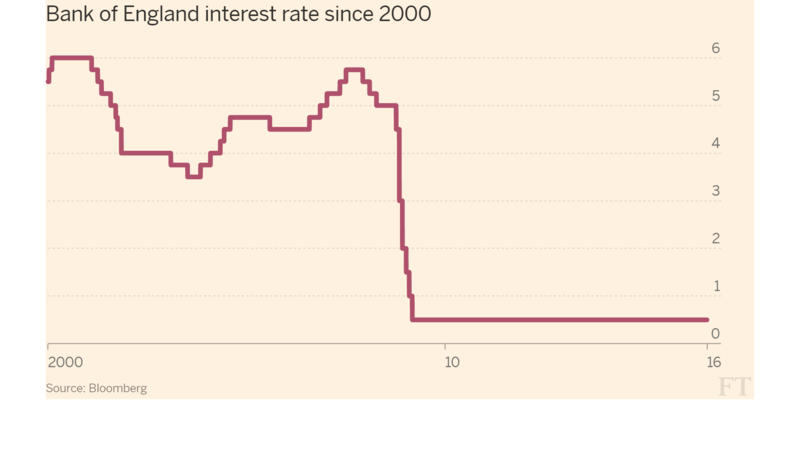 The cut in Bank Rate will lower borrowing costs for households and businesses. However, as interest rates are close to zero, it is likely to be difficult for some banks and building societies to reduce deposit rates much further, which in turn might limit their ability to cut their lending rates. In order to mitigate this, the MPC is launching a Term Funding Scheme (TFS) that will provide funding for banks at interest rates close to Bank Rate. This monetary policy action should help reinforce the transmission of the reduction in Bank Rate to the real economy to ensure that households and firms benefit from the MPC’s actions. In addition, the TFS provides participants with a cost effective source of funding to support additional lending to the real economy, providing insurance against the risk that conditions tighten in bank funding markets. Purchases of corporate bonds could provide somewhat more stimulus than the same amount of gilt purchases. In particular, given that corporate bonds are higher-yielding instruments than government bonds, investors selling corporate debt to the Bank could be more likely to invest the money received in other corporate assets than those selling gilts. In addition, by increasing demand in secondary markets, purchases by the Bank could reduce liquidity premia; and such purchases could stimulate issuance in sterling corporate bond markets. A difficult day for the BoE’s webmaster by the looks of it. The combination of a rate cut and more quantitative easing should be a shot-in-the-arm for business and consumer confidence, lowering borrowing costs and keeping liquidity flowing through the economy. The Bank’s action will help restore confidence in the UK economy and what’s now most important to businesses is that the Government develops a clear plan and timetable for EU negotiations. At the same time, it must press ahead with domestic policy priorities, especially infrastructure decisions, which will allow firms to get on with serving their customers and investing for the future. The Bank really needed to announce this kind of combination of measures. But more for the sake of its own reputation than the economic benefits. Everyone was firmly guided towards expecting something this month, after July’s inaction. What will really count is whether the Chancellor provides a fiscal boost in the autumn. Monetary policy can’t do much more on its own. 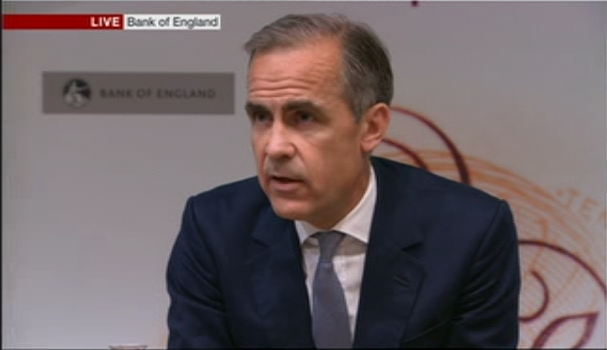 “The UK can handle change” – Mark Carney’s press conference has just begun. Mr Carney describes the measures as “exceptional”. They include a rate cut, a new Funding for Lending scheme, and a QE package including £10bn of corporate bonds and £60bn in government bonds. Here are those growth and inflation forecasts in numerical form (scroll down for the fan charts. Mr Carney says the nine per cent depreciation in sterling will boost exports, and weight on imports but those improvements “are not expected to offset fully the hit to demand”. The governor notes that spare capacity in the UK will rise, causing unemployment to rise from its current 4.9% to 5.5% over the next two years. Inflation will also overshoot its 2% target in 2018, rising to 2.4%. He describes the stimulus package as “a timely coherent and comprehensive package of measures”. Two former MPC members have given their views on Twitter. And they do not agree. He calls it a “token gesture which is unlikely to help the economy much in the current situation” in this blog post for PwC. Mr Carney is explaining the rationale for the Bank of England’s new Term Funding Scheme which will give funding for banks close to the new 0.25% Bank rate. The MPC is determined the stimulus announced is passed through to the real economy. The Bank of England has cut rates and restarted its QE programme. Despite being substantial in scope and scale, its effectiveness at averting a recession is questionable. We see it as a stop-gap solution to show authorities are doing something ahead of more substantial fiscal support later in the year. If incoming economic data worsens, “a majority of MPC members” will support another rate cut at some point this year, says Mr Carney. He adds the BoE is ready to take “whatever action” is required as UK adjusts to new reality. Mr Carney ends the statement there. Time for a Q&A. The first question in the press conference goes to the FT’s Emily Cadman. What can/should the government do? Carney: Monetary policy is “first response” but can’t do anything about structural factors. He says the government’s big job is to negotiate the exit from the EU and to implement a “comprehensive productivity plan”. Theresa May has stressed the importance of productivity since she took over as PM – but then again, so did the previous PM and chancellor, with little impact on the UK’s dire productivity performance. It’s a tough nut to crack. Q: Is the forecast for no recession a result of the Bank’s action? Without it would the UK have fallen into recession? Mr Carney says the Bank’s central forecast is for a relatively modest period of growth in the second half of 2016, “little growth, but positive” he says. Growth is then expected to pick up aided by monetary policy. If we hadn’t taken the steps we have taken, output would be lower and unemployment would be lower. We would have achieved a poor balance in returning inflation to target. With all forecasts there are risks on either side. We have in actions we have taken, through multiple channels, we have improved the economic outcome for this country. There will be less unemployment. Sterling is now 1.4 per cent down against the dollar as the governor explains the rationale for a three-pronged move by the Bank today. Q: The BBC wants to know what Carney’s message is to savers. (It’s a perennial BoE press conference question, that one). Carney says it’s something the MPC thinks about a lot. Returns are very low and they’re likely to be low for some time. The challenge is to get the economy in a position to it can grow sustainably at a higher rate – those are big structural decisions to be made by governments. For savers, pension funds, insurance funds – we can ensure there’ll be a better economic outcome, better growth, less unemployment. Q: Can we rule out the possibility of negative interest rates? We have other options to provide stimulus, if other stimulus was needed. We do not need to go to that resort. The effective lower bound for rates is a “positive number close to zero” he adds. 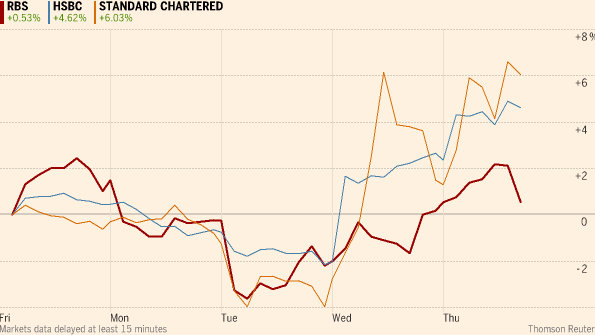 Bank stocks are currently all up today, buoyed by those measures. Q: You’re giving a bung to banks through the Term Funding Scheme. Are you going to include conditions around bonuses etc? 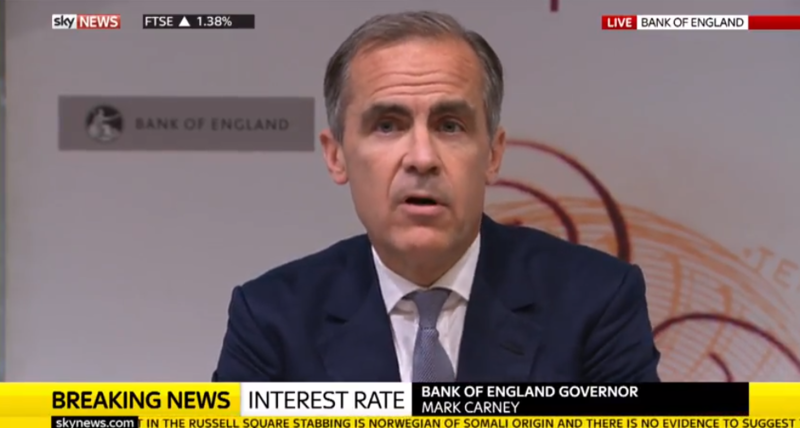 Carney says they’ve carefully calibrated the size of the TFS so in aggregate there’s no reward and no penalty for the banks – it’s just a facility to ensure they can fully pass through the cut in interest rates. It also gives them some “limited but additional flexibility” to cut the rate further, should it be necessary. 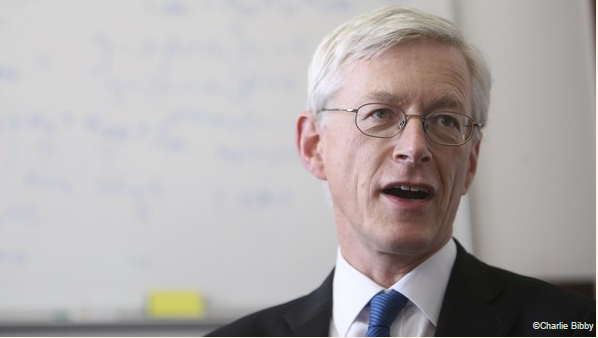 He says there are penalty rates if banks reduce lending. The BoE cut its economic forecast, but the EIU reckons the bank is still far too optimistic about the UK’s prospects. Q: If the Chancellor was to issue infrastructure bonds, would the Bank use QE to fund those bonds? The MPC thinks this is the right package for today. The governor adds it would be inappropriate for him to “countenance” doing anything else at this stage. However, he adds if the data comes in as the new forecasts suggest, the MPC could expect to move Bank rate lower again this year. Q: How extraordinary was the problem you were presented by the Brexit vote? Carney says it’s a large supply shock, which is relatively unusual. What’s “exceptional” is that given interest rates are already relatively low, the MPC has needed to be creative to get the right amount of stimulus into the economy. Q: is this an over reaction based on limited evidence which could undermine confidence? This is a response which will make this process of negotiations, transition, and ultimately Brexit, more likely to be a success. There is a clear case for stimulus and stimulus now for when the economy really needs it. This is about cushioning the shock and ultimately making this a success. Ben Broadbent, BoE deputy governor, adds that weaker employment, investment intentions and confidence surveys means the package is the right one. The Resolution Foundation think tank has translated the BoE’s new forecasts for 2018 into simple cash figures. Real household income is set to be £680 a year lower. Sterling corporate bonds have surged in the wake of the Bank of England’s announcement of a £10bn corporate bond buying package as part of its stimulus measures. Another Q from the press about savers and what they’re supposed to do now. Carney – sounding a bit riled – says the new forecasts show more than a quarter of a million people will lose their jobs – and that’s after the stimulus. Should we ignore that, he asks? Should we change how we manage our responsibilities? Looking at global economy as a whole, a variety of factors are pushing down on global interest rates. As the equilibrium interest rate goes down, we’re faced with the choice of ignoring it and unnecessarily contracting the economy, or adjusting with as smart a stimulus as possible. Q: was the decision not to cut further taken in order come to a unified decision? Mr Carney says there are two reasons for the decision to cut by just 25 basis points. Firstly, Mr Carney says the cut was coupled with other stimulus measures. The reality is we will have another meeting in September, October, and December and will get more data. If it is consistent with the forecast a majority of members are expected to act over the course of the year. We have scope to add if it is necessary. Q: The Term Funding Scheme is meant to make sure banks pass on the benefits of the rate cut, but what assurances have you had from the banks that they actually will? The competition should be there. If you’re shopping around and you’re not getting the benefit, switch, because all lenders are getting access to this facility. Q: How will you monitor how the TFS is going? We supervise the banks, Carney says. We have virtually real-time knowledge of their net interest margins. The margins will be affected by the facility and the economic impact from the package as a whole. We’re not going to act as a shadow FCA on this. We’ll look at the aggregates. 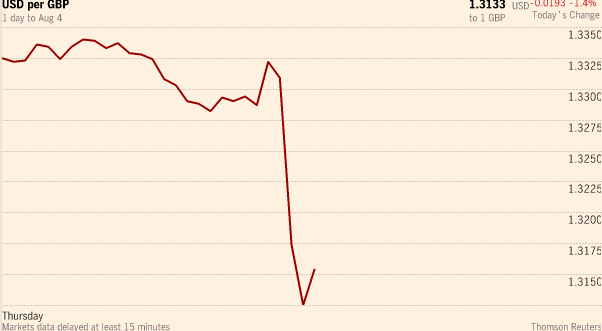 Sterling is now 1.2 per cent down against the dollar, having fallen as much as 1.5 per cent. It is currently trading at $1.3165. 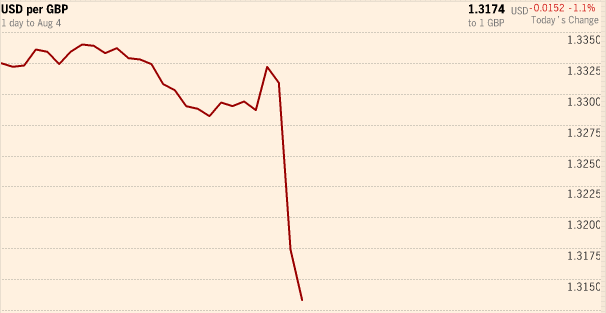 Q: What fall in sterling would raise alarm bells for the BoE? Mr Carney repeats the central bank does not target the exchange rate adding that today’s stimulus measures are targeted at the domestic economy, not sterling. That pass through tends to be protracted, over a number of years. It is that which creates the sharpest bit of the trad- off, because of the pass through of past depreciation of sterling. We are making a judgement about looking through that. There is a limit to which we would do that. We have calibrated this package to appropriately balance that trade off. Q: Will you ever have conversations about negative interest rates? Carney says an emphatic no. “No, I think I’ve been clear on that – just write in whatever you want to take that off the table for me”. Q: What do persistently low rates do to the financial system? Mr Carney says the Bank of England’s approach to financial stability is to recognise “that we are in a low for long world for a long time”. The risks and costs of low rates are “absolutely dominated” by the benefits to the economy, says the Governor. “The reason we have low interest rates is not because central banks choose to have low interest rates”, he notes, adding that weak demand and low growth has led monetary policy to such extremes. Q: Will you reassure investors you’ll see UK through this time? And stay until 2021? Just a reminder: when Carney was appointed in 2012 it was for a 5 year term, not the typical 8 year term. But recently there’s been speculation he might stay for the full period after all. “I see no merit in the strategy” says Mr Carney, who says the notion of helicopter money is something of a “flight of fancy” in the context of the UK economy. The pun was probably intended. Mr Carney faces his last question: How does the BoE make forecasts in an uncertain world? The basic assumption is some reduction in openness beyond the forecast horizon which then affects some of the investment decisions today. The big drivers of this forecast are uncertainty. The adjustments expected in property markets, which have an impact on demand, and some marginal increase in the cost of capital. All of that flows through the outcome. And with that, the press conference ends. Minouche Shafik, BoE deputy governor, delivers some details over the new corporate QE programme. The BoE will be snapping up the debt of 150 investment grade companies. The total universe of this debt is at £150bn she notes, adding that the expected £10bn purchases will be “feasible”. The minimum purchases from each issuer will be around £100m and the Bank will exclusively carry out QE in the secondary debt markets. Carney’s “sledgehammer stimulus” was bigger than markets expected, says RBC economist Sam Hill. The full impact of these interventions will have to be assessed once all the details have been digested. Nevertheless, with Sterling weakening ~1.5% v USD and Gilt yields making a new intraday low of 0.63% it is clear that Carney and his MPC colleagues have been notably more aggressive in easing policy than most expected. The Bank’s intervention should help to support confidence by boosting a range of asset prices. It is not likely though that the MPC will be able to offset all of the economic shock of Brexit. We still anticipate GDP growth is likely to stagnate in H2 2016. Overall though we are clear that it is better that the MPC has been bolder than markets expected today rather than disappointing again as they did in July. Britain’s benchmark stock index is up 1.25 per cent today on the back of that bazooka from the Bank of England. Stocks are on course to top their 2016 high reached last week. The pound has also pared back some losses, having fallen much as 1.5 per cent today. It is currently trading 1.25 per cent weaker against the greenback. Mark Carney is not a fan of negative interest rates. His disavowal of rate experimentation has been enough to help major European banks and insurers all rise in Thursday’s trading. The Euro Stoxx banking index is up 1.8 per cent, with only Monte dei Paschi of Italy slipping in to the red today. In the UK, Standard Chartered is the best performing bank up 4.8 per cent, HSBC is up 2.3 per cent and Barclays is up 0.95 per cent. Fast FT has a nice round-up of economists’ reactions to Carney’s “sledgehammer stimulus” (as they seem to be calling it). In sum: the MPC delivered more than was expected, but there are still plenty of questions about how much monetary policy can do. All eyes will turn now to the Autumn Statement, when new chancellor Philip Hammond will have to decide whether to pull the fiscal lever. Thanks for joining us for today’s live coverage. Here’s summary of the best of Super Thursday.